After heading to downtown Atlanta and meeting up with my good buddies Jack and BK, we decided to check out a few bars in the area which, partially by chance, partially by design, are on my list of recommended Atlanta bars and restaurants. The current list is based on the March/April 2011 issue of Imbibe in which they suggest the top 100 places to drink in the South. JCT (“Junction”) Kitchen & Bar is included under their “Best Contemporary Cocktails” list. A view of the entrance to JCT’s skyline bar. Located in the White Provisions complex on the west side of Midtown, JCT’s upstairs bar is open and airy, with a great view of the Atlanta skyline. Finally, a bar with lots of natural light! No dark hole-in-the-wall place with wood paneling! I personally prefer this kind of atmosphere…it’s nice to have a fresh, cold drink in an open, sleek/rustic setting. 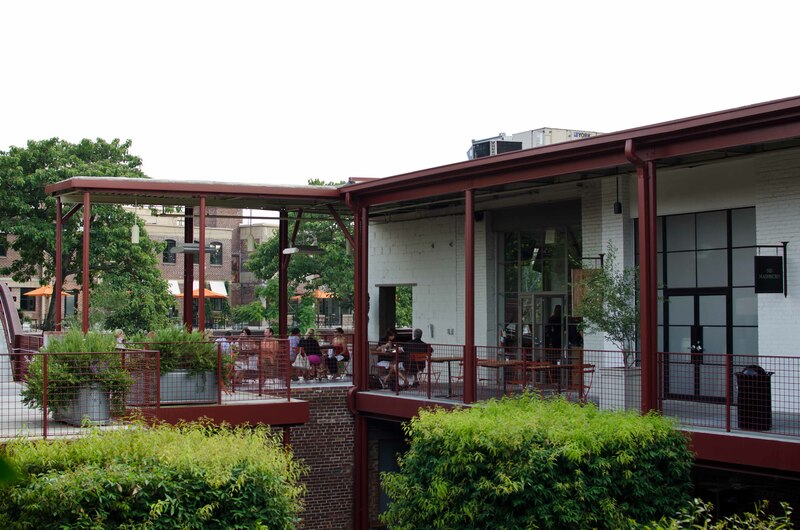 Covered balconies surround the glass-enclosed bar with potted greenery interspersed among the chairs and tables, which are populated with business-casual and summer-dress-wearing patrons. The visiting time? 5pm on a Friday. The bar? Semi-busy, and decently-stocked. No Chartreuse, no amari, and a not-too-enormous bitters selection, but an intriguing menu of original drinks. The bartenders didn’t give us much attention, as they were busy doling out a healthy mix of wine, beer, and tall drinks. JCT feels more like a bar that’s built to move drinks, rather than craft them. I would say it’s headed in the right direction (whom am I to judge? ), and, under a master bartender, it could be much more. But a good start to the evening. Shake briefly with ice and pour unstrained into a double rocks glass. 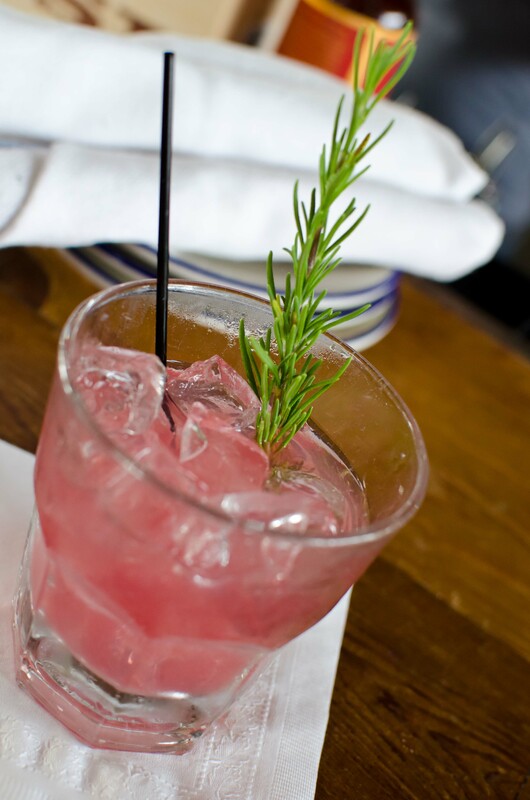 Garnish with a sprig of rosemary, preferably curled in the base of the drink. Good, but dominated by the tequila, and mixed with a less-than enthusiastic shake. The lovely rose hue is due to the hibiscus liqueur, which I imagine I’ll have to get my hands on at some point (side note: I wonder how it compares to the oh-so-excellent-and-intriguing Hum). The Dolin and lemon juice were hiding somewhere in there, not sure where…a slight citrus zing was balancing out the liqueur, however. The rosemary was left out at first (d’oh! ), but it was quickly delivered and added, the mistake rectified; it’s added flavor and nose added a bit of helpful complexity to this drink. The Desert Rose is one of two rosemary cocktails I’ve sampled (the other being Jamie Boudreau’s Rubicon). Also tasted was their Beef Tartare, which resides on their Bar Appetizer Menu, and I must say it was very tasty. On the side was a simple bruschetta, parmesan mayonnaise (delicious on the tartare! ), a pickled anchovy (or perhaps herring), and what seemed to be a pickled, fuchsia-colored egg (Call me ignorant, I’m not sure what it was. Should’ve asked!). More importantly, I got my first taste of Dolin Blanc here! Wonderful, velvety, sweet but not cloying, with a floral and vanilla taste, it’s a spectacular vermouth! In fact, it’s very similar to Martini & Rossi’s Bianco. One to drink on the rocks with a twist of lemon. After JCT we paid a visit to Green’s on Ponce, and Lo! and Behold! There was Dolin vermouth! Unfortunately, in my haste, I picked up the Dolin Dry, not the Blanc, which I don’t believe was even there! Ah well. Overall, JCT Kitchen & Bar provides a good introduction to contemporary cocktails. It did not seem to demonstrate a dedication to crafting drinks, verging on fanaticism, that I had hoped for, but I enjoyed it. On future visits I’d like to sample their dinner menu, as well as two of their other originals, the Double Cross and the Pear Crusta. This entry was posted on July 9, 2011 by IJ Lauer in Atlanta Bars, Bar Visit, Drink Recipe, Tequila, White Vermouth and tagged atlanta, bar, blanc, desert rose, dolin, jct kitchen and bar, review, rosemary, Tequila, visit.